Apple, Google, Microsoft: quo vadis? Recent announcements of Apple and other IT giants have drawn a line in the sand between mainstream and Enterprise Indoor Positioning solutions. Therefore, it seems a good time to revisit the Big 3 and give an update on the new announcements. Our prediction that Apple would announce further strides into Indoor Navigation proved true. Meanwhile, Google has continued pursuing increasing their indoor location capabilities in their recent Android updates. Furthermore, Microsoft surprised everyone with their recent release of Path Guide, as a mark of their intentions to be a big player in this market. Apple recently announced the release of iOS 11 in fall 2017 during their WWDC keynote speech. The update we are most excited about is Apple Maps, which is going to have enhanced indoor mapping features. Apple Indoor Maps will be featured on 30 international airports, including JFK and LHR. The technology used is, after Apple’s acquisition of WiFiSLAM, most likely based on WiFi and smartphone sensors. This approach is not without drawbacks. WiFi infrastructures are typically not optimized for navigation use, which often leads to low positioning accuracy. Furthermore, energy consumption likely will increase. Actual Apple Indoor Navigation seems to not be ready for a market push just yet. Google Maps Indoors has been around for a few years now, providing floorplans of diverse public buildings such as malls, airports etc. within their app. The technology is based on WiFi trilateration, allowing for an accuracy of 5-15 meters. 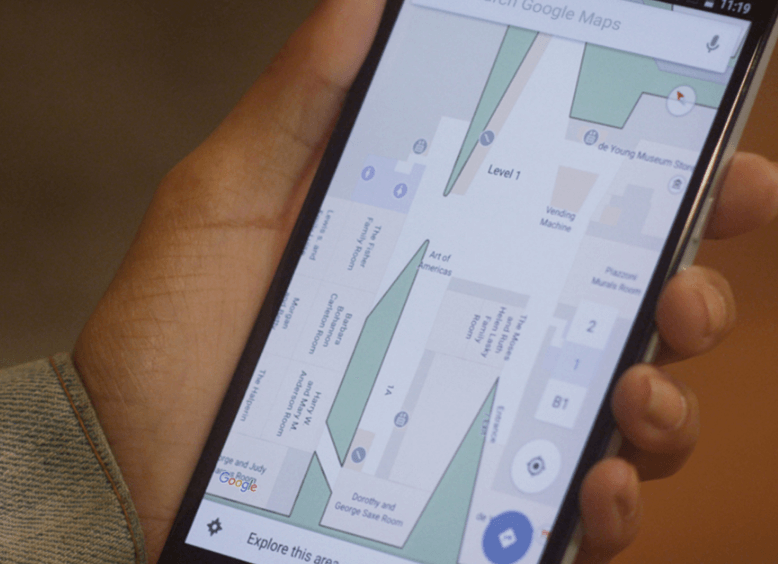 Google also provides a blue dot, however, their focus lies in Marketing, suggesting close-by amenities such as restaurants or stores to the user. Another step towards Indoor Positioning and Navigation has been made with the introduction of their own Beacon protocol, Eddystone, in 2015. It works with the Chrome browser, which is pre-installed on all Android devices, but will need some further integration work for other platforms. Besides Maps Indoors, Google has also been working on Tango, an AR computing platform. The launch of the Asus Zen Fone Ar smartphone, marked the introduction of the first Tango enabled smart phone. These tango enabled devices, are meant to integrate Google’s Visual Positioning Service (VPS) in the future as well, which is supposed to reach sub-meter indoor localization accuracy using 3D computer vision technology. The launch date is still unclear, though. Microsoft Research has pulled a big surprise when it recently launched their Path Guide App for Android without any bigger announcement. The Path Guide is based on “geomagnetism and natural walking patterns” and forgoes any maps. Users are able to record paths and share them with others, which can, for instance, be useful to retailers who want to guide customers to their store. The app offers turn-by-turn navigation, but fails to provide the user’s real-time location outside of these routes. The lack of a big launch has led to a limited download of the app at the moment. Furthermore, Microsoft recently released data of 9.8 billion footprints in 102 US cities to the OpenStreetMap community, whose mission is to provide a free editable map of the world. The most remarkable fact is that the data also includes height information and thus allows for the creation of accurate 3D buildings. Just like the Path Guide App, there was no big launch of hype by Microsoft, yet this shows that Microsoft are interested in the development of a sophisticated OpenStreetMap ecosystem, accumulating valuable data that can be integrated into many apps such as Foursquare, an alternative to Google Maps. The data collected is usually crowd-sourced and comes from registered users. All three are making great strides in commercial Indoor Navigation. Linking search to real-world search results is an obvious application of this technology. Apple have indicated that AI/AR will play a major role in the near future as have Google with project Tango. As Microsoft use the camera as part of their Path Guide mapping app, it is very likely that they will also be looking to include AR in their next phase. These three are mainly focused on the commercial application of Indoor Positioning technology for end users. indoo.rs, on the other hand, is using our knowledge and learning to provide robust and bespoke solutions for the enterprise market, where proprietary data plays a big part. Accurate. Private. Robust- these are the cornerstone features of our solution, which are appreciated by our worldwide network of customers and partners. Our expertise in the industry and continuous research have led us to stay on top and provide professional service & solutions to our clients. This leads us to the belief that there is one major commercial player, one that is number one in product search and also changed the shopping experience for an entire generation…Amazon. As was shown in this blog there is no immediate need for process improvement in the Amazon fulfillment centers, this is much more about Amazon moving deeper into the offline world. According to studies conducted by BloomReach Inc., more than 50% of US online shoppers are consulting Amazon first, before any other online retailer. With e-commerce sales increasing steadily (+13% expected in 2017), this, on the one hand, means bad news for other retailers, and on the other shows that Amazon definitely needs to be considered a worthy opponent or affiliate. This also reflects in a current rumor, that furniture giant IKEA is looking into selling their Billies and Hektars via Amazon. Is Amazon going to close the gap between online and offline retail with Indoor Positioning? Amazon’s leading role in IoT & online retail and its endeavours to take over technology-assisted offline retail space also shows in their introduction of Amazon Go and their latest acquisition of Whole Foods (Amazon’s largest deal ever!). All of these are indicators for their next big move – connecting online and offline shopping, which will ultimately require Indoor Positioning.